Oxidative stress is the precursor to oxidative damage. Oxidative stress occurs when there is an imbalance between the production of free radicals and the body’s ability to counteract their damaging effects through neutralization with antioxidants. Oxidative damage is the harm sustained by cells and tissues that are unable to keep up with free radical production. You’re probably familiar with the damage that too much sun exposure or tobacco smoke can do to your body. 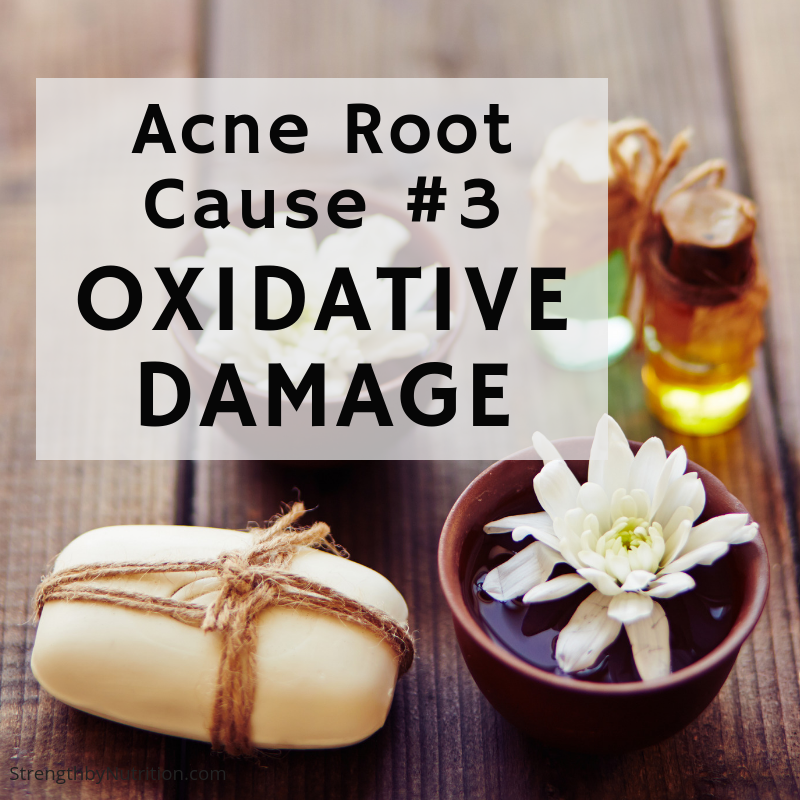 These exposures can cause oxidative damage to the cells that make up our tissues. and go on to cause oxidative damage to our organs, including our skin. Whatever your skin type, toxin exposure is the primary trigger and avoiding toxins is essential for clear, glowing skin. Where do these toxic chemicals come from? Unfortunately, the number of harmful chemicals in our environment is increasing at an alarming rate. Pesticides, herbicides and pollutants are washed into our natural water resources. The crops we eat absorb these chemicals as well, which hits us with another sources of exposure. To top it off, the animals we eat also live off the same water and plants and accumulate these toxins in their meat, fat and byproducts – all of which we consume. One of the most effective ways we can reduce the harmful effects of these chemicals is to eliminate the exposure. This means choosing a better water and air filters for your home, replacing conventional cleaning and laundry products with safer alternatives, and switching out all your body care and cosmetics with safer brands (like Honest and Beauty Counter). You can read more on how to clean up your home here and self care products here. Research has shown that many common ingredients found in skin care products are hormone disrupting and even carcinogenic. We’re exposed tothese chemicals when we inhale them from sprays, absorb them from our skin, and ingest them from our lips. Statistics show that women wear, on average, 12 personal care products per day, while men used an average of 6. Based on the average number of ingredients per care product, that amounts to nearly 126 different ingredients daily! In a study undertaken by Reading University in the UK in 2012, it was reported that 99% of breast tumour tissue analysed contained at least one paraben, with 60% containing at least five. Knowing that oestrogen drives the growth of breast tumours, and parabens are ‘oestrogen-mimicking‘ chemicals, the results show an almost conclusive link between parabens and breast cancer. While it’s not concrete evidence to show that a pot of moisturiser causes tumours, and other factors must be considered, the EU has banned these harmful ingredients in skincare. Australia has not. Triclosan is an anti-bacterial agent found in hand soap. In 2016, triclosan was banned in cosmetic products in America as there is insufficient dataon the safety of the chemical ingredient. Triclosan is still found in baby products and skincare cosmetics throughout Australia and, as a known carcinogen, we will always tell you to avoid this harsh ingredient. While it’s unlikely to be included in products at a level considered ‘dangerous’, there isn’t enough evidence to know the risks of long-term use, so we will always err on the side of caution. This is cancer after all. Ethanolamines are a derivative of coconut oil commonly found in soaps, cleansers, shampoo and sunscreen. When mixed with specific preservatives, the reaction forms nitrosamines which carry carcinogenic potential. As a result, the European Commission has banned ethanolamines in all commercial use across Europe, but it’s still likely you’ll find them in skincare across Australia. BHT and BHA are controversial ingredients often used in acne creams. Used for their anti-oxidant properties, BHT is a synthetic ingredient primarily used as a preservative but also used as a supplement to reduce free radical damage. BHA and BHT are a double-edged sword because they may also contain anti-cancer properties. But the debate lies on whether this is at the cost of causing cancer elsewhere in the body. BHT and BHA have been banned as skincare ingredients in Canada and the EU based on the fact that nobody really knows the long-term effects, and those countries aren’t prepared to risk the consequences. Formaldehyde and formaldehyde-releasing preservatives (FRPs) are harsh preservatives and known human carcinogens and can lead to cancer if exposure occurs at high levels. These ingredients are still permitted in skincare in Australia with the government-owned NICNAS confirming that small amounts applied topically don’t pose a risk to humans. Formaldehyde and FRPs are banned in some countries including Japan, however, in Australia, still permitted in small quantities despite the ACCC confirming cancer as a risk of high exposure. According to the IARC, there is sufficient evidence in humans confirming the carcinogenicity of formaldehyde. And that’s good enough for us to stay away! To read more on fragrance, click here for our in-depth coverage of what fragrance is, how our bodies interact with it, and the potential health risks associated. While all toxins are unavoidable, there is a way to up regulate our body’s innate ability to detoxify environmental chemicals and keep our hormones balanced. Our livers, kidneys, and intestines are our main organs for detoxifying. However, even with our body’s great cleansing abilities, we sometimes need to offer it extra support to ensure optimal functioning. The first step is reducing exposure which we just talked about. Next we will ensure your body is provided the necessary amino acids, vitamins, and minerals to optimize its innate detoxification processes. Because of the lack of nutritious foods in our diet, many of us are typically low in essential vitamins and minerals. Therefor, ramping up your vegetable and fruit intake is the easiest way to improve your detoxification processes. Specifically, cruciferous vegetables (turnips, cabbage, kale, brussels sprouts, cauliflower, broccoli, mustard greens, onions, garlic, radishes, etc). These vegetables, in particular, contain glucosinolates (indole-3- carboniol, diindolymethane (DIM), sulforaphane, and isothiocyanate). You can also drink better teas such as dandelion, chicory, and milk thistle to support kidney and liver function. For a little extra oomph, you can add in some detoxifying supplements such as N-acetyl-cysteine, Vitamin C, and milk thistle. How much water should you really be drinking per day? An easy way to find out is to divide your body weight by 2 and add 15 to get the number of ounces of water you need per day. Make sure that your water is filtered via reverse osmosis and run through a charcoal filter. Fiber improves digestion, blood sugar balance, nutrient absorption, and beneficial microorganism growth in the intestine. 25g per day is the minimum to prevent colon cancer, but we recommend anywhere between 35-50g per day (depending on tolerance). An easy way to increase fiber is through potatoes, avocado, berries, flaxssed, chia seeds, fruit, beans, and whole grains. 4) Take 400 mg of Magnesium Citrate. If the first 3 steps aren’t providing you with relief after a couple weeks, then add this supplement before bed. We recommend starting at 150mg and increasing from there. If nothing on this list has help to improve your bowel movements, then we recommend to work with a health care provider to find a laxative to temporarily get things moving. Remember that we cannot completely decrease our exposure to chemicals in our environment, but what we can do is our best at reducing the exposure and improving our innate detoxifying pathways. By doing so, we can reduce the oxidative damage to our organs, including our skin, and as a byproduct, reveal healthy, glowing skin.